The St. George’s College staff and community celebrate the Easter pilgrimage of the The Most Rev. Michael B. Curry, Presiding Bishop and Primate of the Episcopal Church. The pilgrimage included visits to sacred sites in and around Jerusalem and paying respect in a private visit the Greek Orthodox Archbishop of Jordan and the Patriarchal Commission to Bethlehem, Theophylaktos, and His Beatitude Theopholis III, Patriarch of the Holy City of Jerusalem and All Palestine, who called the Presiding Bishop Curry, ” our brother,” and presented him with an engolpion. A day trip to Nazareth included conversations with students at Christ School as well as Palestinian students involved in https://www.jerusalempeacebuilders.org who shared with the Presiding Bishop the impact this interfaith program has on their lives and hope for peace in this land. 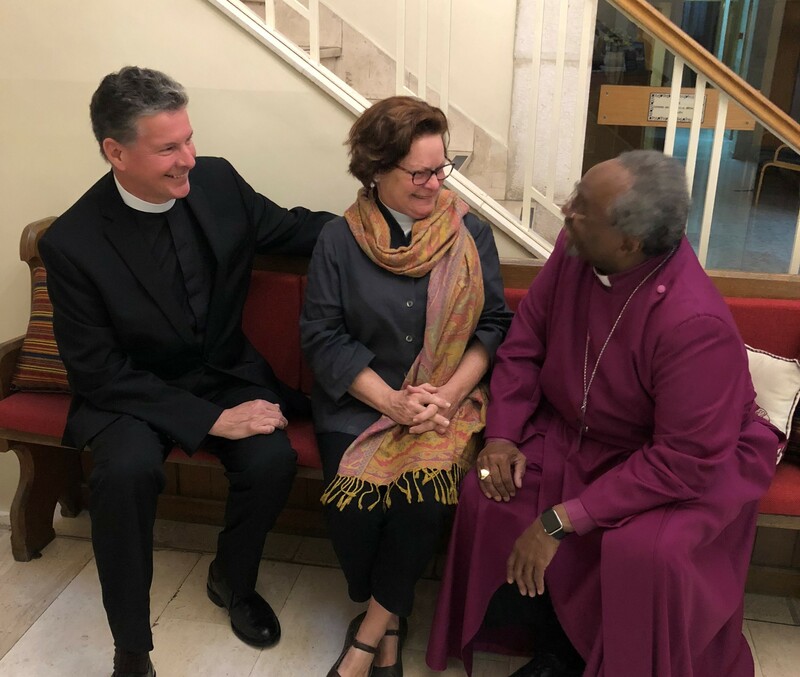 Presiding Bishop Curry spent an early morning visit to St. George’s College with Acting Dean the Rev. Canon Richard LeSueur, and the Rev. Dr. Susan Lukens, Associate Dean. Accompanied by the Rev. Canon Chuck Roberston, Chuck reminisced about his own memories at the college whilst he spent time here on a pilgrimage study course. Susan explained to the Presiding Bishop that nearly 80% of the pilgrims enrolling at the St. George’s College for a course are from North America, so the visit of the Presiding Bishop was one of gratitude for such sustaining support and lasting friendships with both lay and clergy from the Episcopal Church. The St. George’s College staff and Cathedral close community will long remember the affection and care from the Presiding Bishop and his staff; their admiration for this land of the Holy One and the pilgrimages provided by the college blessed our mission. We are grateful for the contribution of writings from the Episcopal News Service, The Rev. Mary Frances Schjonberg Interim Managing Editor and the photo is attributed to Sharon Jones, Executive Coordinator to the Presiding Bishop and Primate.